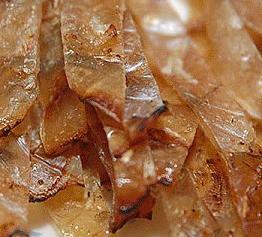 Jeepo is a very popular snack that is enjoyed by Korean of all ages. It's made up of boneless, dried fish meat that are packaged and readily available for purchase in almost all Korean supermarkets. To prepare them, they can be cooked right out of the package over a gas stovetop or using a frying pan on electric stoves and ready to eat under a minute. Both sides are evenly cooked but crispy edges are usually an outcome from scorching them in open flames but favored by everyone. Once cooked, they are usually cut into pieces with a scissor and eaten plain or dipped in mayo and/or gochujang as its dipping sauce.